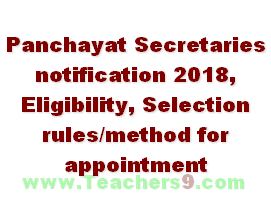 A.P Panchayat Secretaries notification 2018, Eligibility, Selection rules/method for appointment. ap panchayat secretary notification 2018, ap panchayat secretary notification latest news, panchayat secretary recruitment 2018. The appointment of Panchayat Secretary on contract basis shall be under the provisions of Rule 9(a)(i)of A.P.SSS Rules,1996. A person appointed under contract basis shall not be regarded as a member of the service in which/the post to which he/she is appointed and shall not be entitled by reason only of such appointment to any preferential right to any other appointment in that or in any other service. Persons possessing minimum degree qualification (graduation) will be taken for contract appointment of Pts. Secretaries. Candidates to be appointed as Panchayat Secretaries should be in the age group of 18-42 years. Five (5) years relaxation of age in respect of candidates belonging to SC/ST/BC category is permissible in terms of G.O.Ms.No.182 GAD Dt:4-12-2017.. The persons for appointment as Panchayat Secretary shall be locals drawn from the district concerned. The person appointed on contract basis as Panchayat Secretary shall work in any of the Gram Panchayat in the district and reside in the Gram Panchayat Head Quarters concerned. Panchayat Secretaries appointed on contract basis are eligible only for casual leave. They are not entitled to any other kind of leave like Earned Leave/Half Pay Leave/Medical Leave, etc. The Panchayat Secretary appointed on contract basis shall not be construed or regarded as a member borne on the A.P.State & Subordinate Service Rules, 1996 and shall not be entitled to any preferential right for any other appointment in the service or in any other services. The candidate engaged on contract basis shall execute a bond containing the above mentioned points in Annexure-III. The format in which the candidate has to execute the bond is enclosed. How to apply this posts.? Who can contact this posts will contract basic...? A separate local announcement regarding panchayat secretary notification will be released with in short period from your district collectorate.